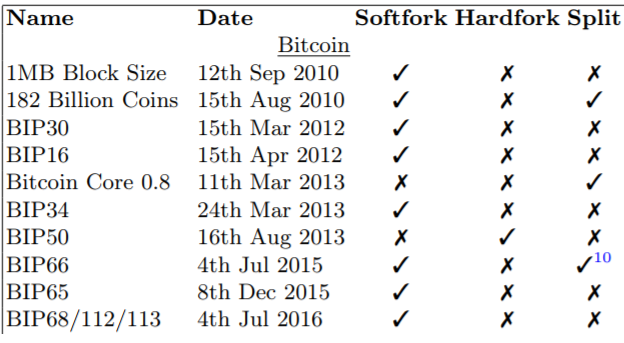 I was looking to study the history of Bitcoin forks including the 2013 incident that may or may not have been a Hard fork depending on your definition. There is a paper that provides extensive detail on the history of all kind of forks on Bitocin, Ethereum and Ethereum Classic, you can read it here, Atomically Trading with Roger: Gambling on the success of a hardfork. Please reffer to githubs help page for searching issues. Not the answer you're looking for? Browse other questions tagged bitcoin-core blockchain-fork bip soft-fork or ask your own question. How is a hard fork resolved? Has a hard fork ever occurred? Why is it dangerous to hard fork the Bitcoin network? Where can I find a record of blockchain soft forks? In overview, what is “Bitcoin Cash” and the hard fork on August 1st 2017? What if old blocks invalidate with soft fork? Forks to be aware of other than Bitcoin Cash and Bitcoin Gold? Is there a list of Bitcoin Forks? Why is a softfork unable to divide the network?